Embarcadero developers Jim McKeeth and Malcolm Groves are literally on fire lately with their tutorials for building Delphi XE7 Firemonkey apps on diverse devices. Jim McKeeth has a extensive tutorial for using the new Delphi XE7 multi device designer to build an Android app for the Moto 360 watch from Motorola. In his tutorial he demonstrates how to create a custom View for the shape of the watch. Basically in XE7 you have a master View where your UI components are setup and then you have the individual device views where you can make changes for the specific device size that you are working with (like the Moto 360 watch). He also goes into detail on how to connect and deploy your app to the watch device. 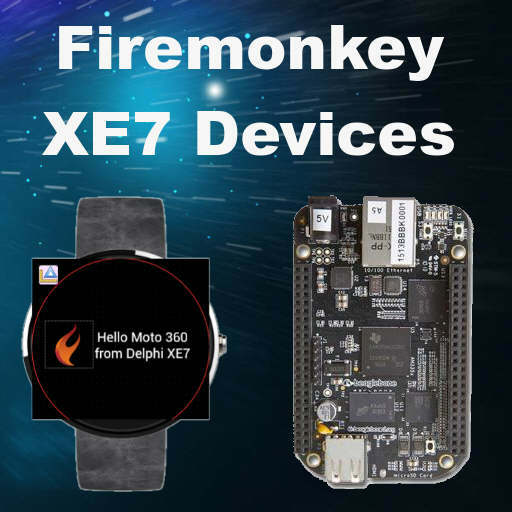 Malcolm Groves has a tutorial on building Delphi XE7 Firemonkey apps for the Beaglebone Black mini computer which is a small single board computer with an ARM Cortex A8 processor. The device also has a microHDMI port for connecting a monitor. Apparently the mini computer ships with Linux installed on it but Malcolm explains how to install Android on the device using a MicroSD card. Once you have the Beaglebone mini computer running Android he then shows how to get it connected to your Windows machine via USB. With the USB link setup the device should show up in the Delphi or AppMethod project target platform. One click later and the Android app is deployed from Delphi XE7 onto the Beaglebone Black. Both of these devices support the NEON instruction set which is required for the Firemonkey Android NDK support. The XE7 multi device designer really starts to shine once you start deploying apps to more than just one screen size. Head over and check out the full tutorial from Jim on deploying Firemonkey apps to the Moto 360 Android watch. Continue on over to Malcolm’s blog and read the full write up on developing Delphi XE7 Firemonkey apps for the Beaglebone Black mini computer.